Welcome to Our Homepage. NEO Restoration Alliance is an organization focused on Environmental Justice and Environmental Equity. We are located in the Greater Cleveland area of Ohio, and our focus is on Restoring Lives and Land in Our Community. We seek equity for populations that have been marginalized by the industrial revolution and the digital divide: inner city residents from all cultures, and specifically people of color. We are committed to Environmental Advocacy, and one key area of focus for our advocacy is: Green Jobs as a way of restoring the Northeast Ohio Economy. 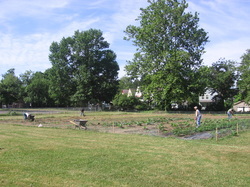 We focus on Urban Agriculture and Local Food as vehicles for Social Justice, Economic Justice,and improved health for those living in the central city, suburbs, and beyond.